The 2014 Pacific Coast League Most Valuable Player, Joc Pederson of the Albuquerque Isotopes. 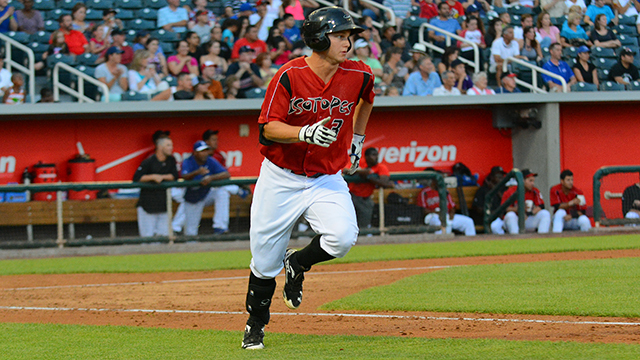 ROUND ROCK, Texas - Joc Pederson of the Albuquerque Isotopes has been named the 2014 Pacific Coast League Most Valuable Player, the league announced today. Pederson received more than half of the votes from the 16 field managers as well as media representatives from across the league to be named the 78th PCL MVP in league history. The MVP award caps an illustrious week for the 22-year-old, who last Saturday became the fourth player in the PCL's 112-year history to record at least 30 home runs and 30 stolen bases in the same season. The center fielder is the first player to accomplish the feat in the league's modern era and the first since Frank Demaree (45/41) reached the mark while playing 186 games for the Los Angeles Angels in 1934. On Monday, Pederson was selected by the league as an outfielder on the All-PCL Team, and the following day he was named the Rookie of the Year. The native of Palo Alto, California, has hit league-best 33 home runs this season and is on pace to be the Isotopes' fourth ever PCL home run champion. Pederson also holds PCL-highs in the runs scored (101), total bases (256), walks (96), on-base percentage (.434), and OPS (1.024). He has set new Isotopes' records with his runs scored and walks totals. The PCL's starting right fielder at the Triple-A All-Star Game in July, has compiled a .304 batting average and stolen 30 bases in 118 games this season. The MVP Award is the first of Pederson's professional career, after being chosen by the Los Angeles Dodgers in the 11th round of the 2010 First-Year Player Draft. He becomes the first Isotope to receive the honor and the seventh in Albuquerque's Triple-A history. This is the third-consecutive year that the PCL's MVP has also been the Rookie of the Year recipient, as Pederson follows Reno's Chris Owings and Adam Eaton who took home both awards the previous two seasons. Among the others to receive votes for the Most Valuable Player award were Javier Baez (Iowa), Kris Bryant (Iowa), Adam Duvall (Fresno), and Shane Peterson (Sacramento). All statistics are through Wednesday, August 27th.